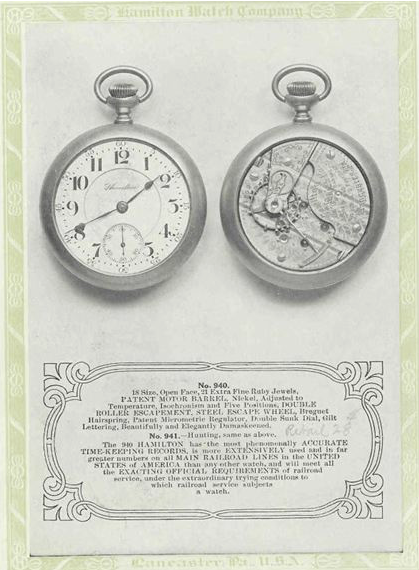 At the turn of the last century pocket watches were the dominant timekeeper for men and women. There were many US-manufacturers but Hamilton was well known to be among the very best. Hamilton offered over 30 different pocket watch movements - starting with the smallest, at 0-size (zero size), ranging to the largest, at 18 size. Smaller 6/0 movements would be introduced in the teens. The dominant form of transportation at that time was the railroad - and keeping the myriad trains running on schedule required precise timekeeping. Hamilton's railroad-approved models were the dominant timekeepers used on the major railroads of the time. One of the most popular railroad watches was the 21 jewel, 18 size 940 movement, presented in an open case. The same movement, when placed in a hunter case (with a cover) was the 941 movement. 940 movements were so popular that they are still easy to find. They were introduced in the late 1890's and produced into the 1920s. Being 18 size, they are really large... so large perhaps that eventually people preferred the slightly smaller, but still railroad approved, 16-size watches like the 992. So, that could mean that the reason there are so many nice 940 watches out there is they didn't get used as much over the past 100 years as other watches may have... that, and the fact that they were extremely well made. I recently purchased a Hamilton 940 online and I got a very good deal since it was kind of dirty, had a bent hour hand and came in a "silveroid" case. Silveroid does not contain silver but it's silver-colored and very robust. It polishes nicely too. It was definitely less costly than gold filled cases at the time. Part of the challenge with getting a nice pocket watch from this period is to get one with a nice un-chipped porcelain dial. These old dials will often exhibit small chips, hairline cracks or both. Most railroad watches are lever-set, so there's a little lever next to the dial that you pull out in order to set the time. Pushing the lever back in puts the watch back in winding mode. Since you have to remove the front bezel to get to the lever, the dial is exposed - which is one reason why so many dials got chipped. They also need to be carefully removed during servicing - or damage can be done then too. The watch I purchased has an excellent dial. I overhauled it today and it's running great - as it should - but that's still pretty amazing for a 100+ year old watch. Based on the movement number, 528569, this watch was made in 1906. In this shot you can see the balance wheel is blurred by motion. Is that 940 a single or double roller? I believe all 940 movements have double roller escapements. I did a little digging and it appears 1906 was the year Hamilton introduced the double roller on the 940. Prior to that it was single roller. I don't know when they started marking the movements as double roller though... seems like maybe post-1910 but I don't really know for sure. 940 movement numbers prior to 512000 were SR. After that, they were DR. Source to the info above, any of the Shugarts Watch guides, Hamilton section. Specific start number for DR, 512200. Is the spring generally hard to wind (compared to other watches) and what is the reserve time - 20 hours? I have a 940 that was my grandfather's railroad watch (S/N 574959). It has Roman Numerals rather than numbers. It's seen a hard life and doesn't run. I was wondering if anyone can recommend a reputable place to have it restored. Thanks in advance! 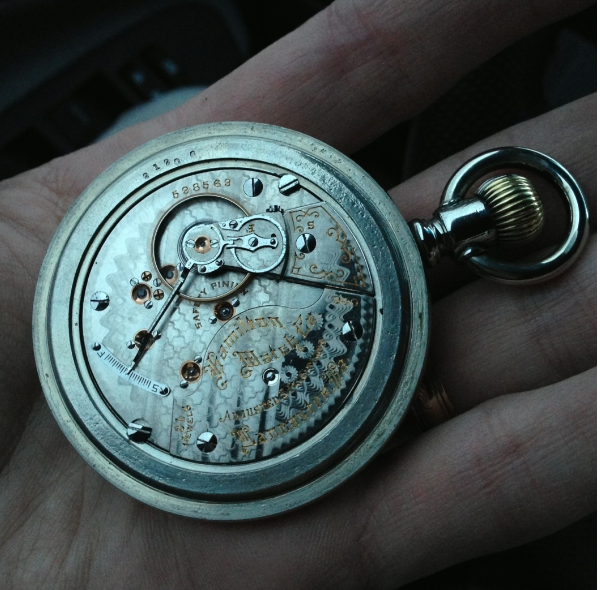 I am very new to Pocket Watches. Threads such as this one have greatly increased my very limited knowledge. I thank everyone who posts. I started with 992B, then because of this thread I decided I wanted an 18 size RR watch. I used all my sock money and purchased a 946. The movement runs great, looks great, and dates to 1906. Now, my rookie question: It has a Dueber case that says 14K, Two plates of gold over fine hard metal and to wear for 20 years. Is this a correct case for this watch? Is this "gold filled"? And my biggest question, Is this case worthy of the great 946 movement? The standards for "gold filled" wasn't in place 100+ years ago so different folks described non-solid gold cases differently. One approach was based on "wear warranty". A 20 year case had a thicker gold layer than a 15 year case but thinner than a 25 year case. When standards did come along, the term "gold filled" usually came with additional terminology like "1/20 14K gold filled" or "1/10 10K gold filled". The 1/20 means the thickness is 1/20th gold or 5%. 1/10 is 10th or 10%. 10K and 14K are the alloy of the gold, of course. So a 1/20 case has less gold than a 1/10 but has still WAY more gold than gold plate, where the gold thickness is measured in microns. As for your case... your watch is from a time when jewelers sold movements uncased and allowed the buyer to pick a case to put it in. So a buyer could buy a fine movement and put it in a silveroid case if they wanted. Eventually the watch companies "vertically integrated" and sold their watches pre-cased... but they still sold them uncased as well. It's not unusual to see really fine railroad-grade watches in a non-solid gold case. After-all, not all "railroad men" owned the railroad. However, the 23 jewel grades were so expensive that if you had the scratch to buy one, you probably had pockets deep enough for a solid gold case too. So it is a little unusual to see a 946 in a non-solid case. 22 years after your watch was made, the Great Depression struck and maybe the owner of the watch sold the solid gold case and recased the watch... who knows? HandyDan, having trouble posting! Thanks for the great info. The case has 8 service marks. One looks like a 1933 date. I may be looking for a gold case then, another quest! Generally, how do collectors feel about re casing? Thanks. Collectors always favor an all-original watch. It's hard to tell, of course, after 100 years whether or not the case is original. One way of telling is if the case screws are in a different place and the original screws that secured the movement left a mark on the case. I have located a Keystone open face,swing out, lever-set gold filled case in great shape for under $200. Would that do the 946 justice or should I hold out for better? The Duber gold plated case looks good, but I am reminded of costume jewelry! I am new to the hobby and welcome advice. I agree, a gold plated case just won't cut it for any Hamilton pocket watch, let alone a 946. 946's often came in a solid gold case. But gold filled will work fine too if it's in nice condition. Check out eBay for 946 listings and you'll get an idea of the style cases that are appropriate. It sounds like you're on the right track though. These old size 18 "gold filled" cases often have a lot more gold than the usual gold filled case but they don't have $200 in gold in them - that's for sure. I would think $100 is a fair price for a gold filled case. One option is to keep your eye open for any working Hamilton 18 size watch you see with a 17 jewel movement but a nice looking case. Buy that for $100-$150 and then use the case for your 946. Then put the 17 jewel in your Duber case and resell it. Whatever you get for it decreases the cost of your "new" case. Thanks for the great advice. The final blow for the Dueber. I got the watch out and closely examined the case... screw marks........The 946 will not go out in public until it has a better case. My hope is to locate a solid gold one, but I will watch for the 17 jewel option also. The trouble with that is, if I get a nice 17 jewel I will want to keep it for a day use watch. The 946 will be for special occasions. Handy Dan, here I am again with my hat in my hand looking for advice. I see you are self-taught. I am good with detail work on small items. I am contiplating taking on the balance staff replacement on a 940. No offence intended to watchmakers on this site. I just think I would enjoy doing my own simple? Repairs. I have been studying, this repair is way beyond me. Please disregard the above list! Looks like I will be taking it to a watchmaker. Yes, for a minute I was thinking I might have to call you "crazy george". Replacing balance staffs isn't complicated if you have the tools but there's a lot of skill needed to use the tools precisely. If you screw up the roller or the hairspring it won't matter that you've got a good balance staff. I've only done it a couple of times but I have a LOT of broken balances and someday I will sit down and do it over and over until I get the hang of it. 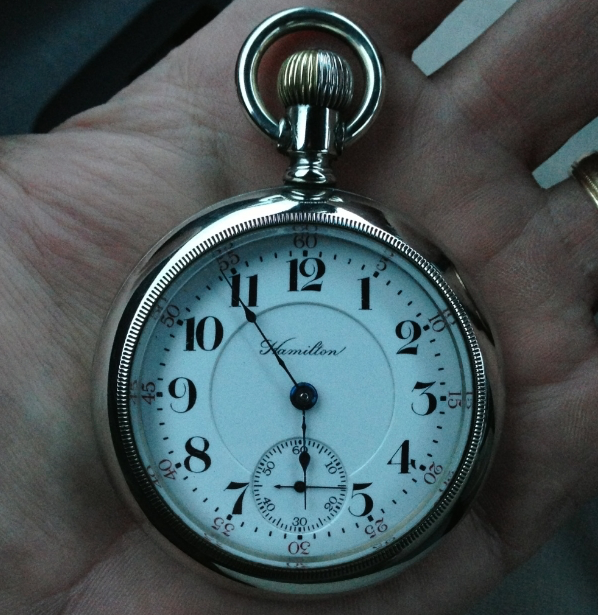 my son recently purchased a Hamilton stainless steel double roller 21J pocket watch. His pocket watch has 4 hands. Hour, minute, second and a brass colored hand which we'd like to know what it's for. We've only seen one picture on the internet that shows a similar watch. My question is 1. Did they make a watch like this or 2. Do you think its a fake? I doubt it's fake but I don't know what it is without a photo. You can send me an email or contact me through Etsy. It sounds like you have a dual timezone hour hand installed. When railroad men had to work across two time zones, many of them hand a second hour hand installed that reflected the second zone. How long does a watch usually run on a full winding? Depends on a lot of things but generally speaking it should run 40+ hours.